Today was a Great day! 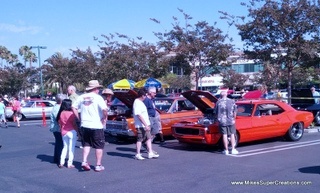 I drove out to Moorpark, where the Roam'n Relics Car Club held there 33rd annual car show on High Street. This year they had the largest turn out in 5 years, topping close to 500 cars! and 5,000 attendees. I pre-registered and was entry number 222, and when I arrived at 7:45 - a bit after the "gates" opened at 7am, High Street was filled and I was escorted to a lot with about 10 other late arrivals. The show was nicely done, and I was told it took them 4 days to prep, as they had the sound system run up and down the street, figured parking and arranged with the merchants on the street. Food and vendors made the time pass quickly when not taking in all the cars. After some four hours of soaking up the sun, talking and walking... it was Trophy Time! 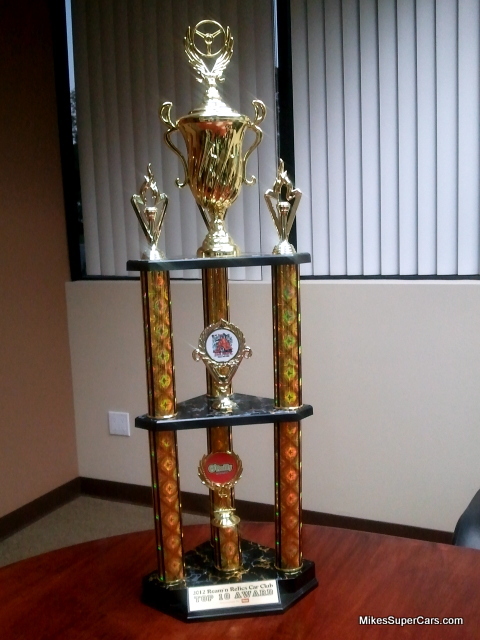 Roam'n Relics provided "celebrity" Trophies, such as People's Choice, Mayor's choice, Police Choice and Fire Choice and then 10 awards they called the "Top Ten," with no further ranking. The presentation of the trophies was top notch similar to a Concours d' Elegance event, where the winners were staged and the paraded past the stage and presented with the trophies. This is a great approach, as the attendees can then relate to the winning cars. I was fortunate enough to receive a Top Ten trophy ! It is always great to win, but equally satisfying is when spectators extend themselves express their appreciation for the car. To all those, Thank You! A big part of participating at shows and cruises is to share - ideas, concepts and good times.